Above: The great Daphne Pollard, onstage in the US as “Dolly Varden” c1907. The working life of prolific Hollywood based Director, Alf Goulding (born in January 1885), is well documented – he directed over 200 films between 1917 and 1959, and wrote and appeared in many others. It’s less commonly known that Goulding owed much to his juvenile experience with the Pollard Lilliputian Opera Company, and that he was a Melbourne neighbour and long-time friend of Daphne Pollard (Trott). Like Daphne, Goulding was born in inner Melbourne. His father Frank, and mother Maggie (stage name Maggie Walsh) were both involved in local Melbourne theatre, with moderate success. Sadly, Maggie died in 1895, while their three children were still young – Alf was aged just 10. A half-sister from Maggie’s first marriage, Elsa Goulding (sometimes spelled Elsie Golding), had gained some reputation as a singer by 1893 and, determined to maintain the family tradition, Frank encouraged his oldest son Frank junior, Alf and younger sister Irene to go on stage. Inevitably all three Goulding children ended up in Pollard’s travelling troupes, where they met Daphne and Ivy Trott. Tragically, Frank Goulding Junior died in Calcutta in January 1897, while on a Pollard tour, aged only 13. His sad death from pneumonia, far from home, appears not to have dampened Alf and his sister’s enthusiasm to work for Pollard’s. Only a few years later Alf and Irene were on tour, Irene performing in partnership with Ivy Trott to great acclaim. Alf and Irene joined the 1901 and 1903 Pollard tours of North America and obviously the experience of working in the US sparked an interest for Alf, as it did for Daphne Pollard. But back in Melbourne, Frank Senior found the new century and the life of a widower, hard to deal with. Now a bootmaker living in Richmond, he blamed the Pollard company management for the death of Frank Junior and began to send abusive letters to the Melbourne managers, even while they engaged Alf and Irene. He complained that the money promised to him for employment of his children had never been paid. Frank had already been publicly embarrassed the year before, when details of his passionate letters to a sometime servant/petty thief were plastered about the Melbourne papers. In 1903, his stream of abusive letters saw him end up in court again, a lonely father disconnected from his two children. In 1908, Alf left Australia again for an Asian and North American tour with another Pollard troupe, it appears to be his fourth tour. The Company could hardly claim to be “Lilliputians” now – Alf was 23 and his role was now stage management! Soon after this tour ended in early 1909, he left the company to try his luck in the US. Perhaps he was inspired by Daphne Pollard’s great success with Frank Healey’s San Francisco Opera Company after 1907. Alf Goulding appears to have maintained a personal and professional friendship with Daphne Pollard for much of his life. 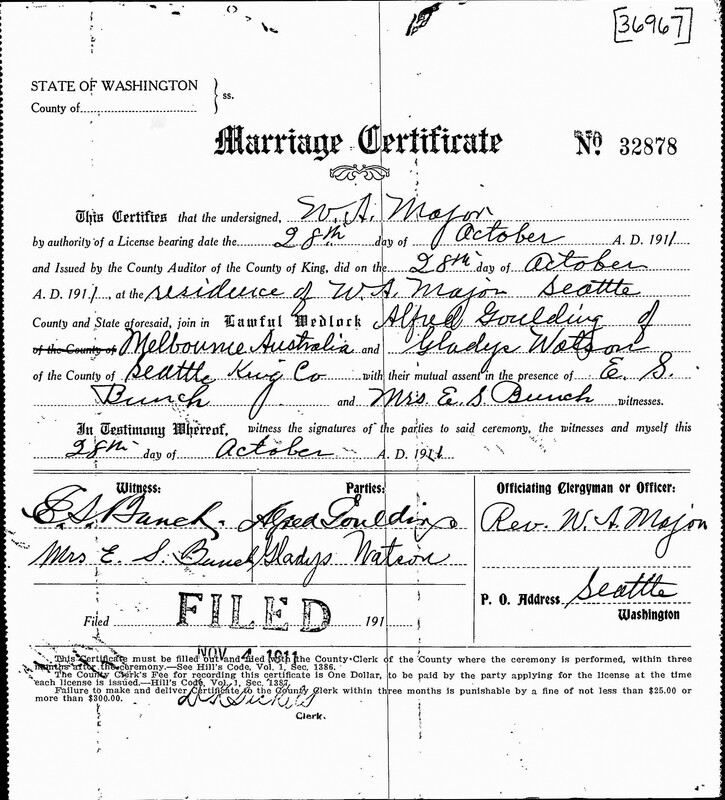 Three years after moving to the US, Alf was married to Gladys Watson, with Daphne (Mrs Ellington Bunch) and her husband as witnesses. 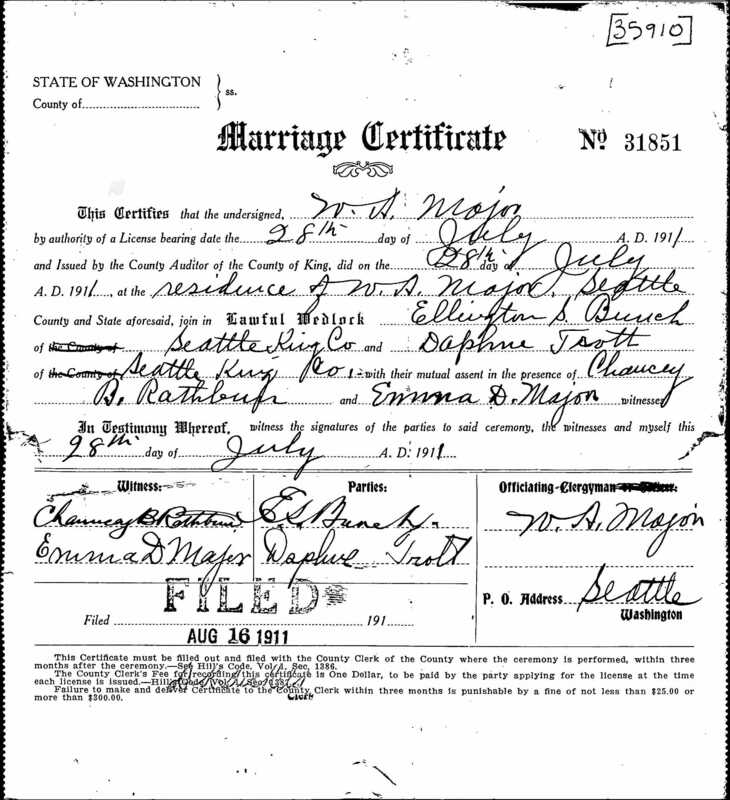 They were married in Seattle by the same official as Daphne and her husband had been, exactly three months before. Goulding and Pollard then worked together on stage in Los Angeles, performing in such musical comedies as “A Knight for a Day” in 1914. It is hardly a coincidence therefore that Goulding is reputed to have been instrumental in convincing Daphne to work for Mack Sennett, and he was apparently on hand when she arrived at Sennett studios. He also directed a number of her first films – including “Run Girl Run,” “The Swim Princess” and “The Campus Carmen”. There was perhaps a real camaraderie amongst the old Pollard players. When former Pollard alumni Teddy McNamara died of pneumonia in early February 1928, on the eve of great success, all the Hollywood based former Pollard players attended his funeral – Goulding, Daphne Pollard, Harry “Snub” Pollard and Billy Bevan. It is fashionable to suppose that all Australians who go to act in Hollywood become firm friends with each other, “a gum – leaf mafia” as they have been dubbed. At least, we are still encouraged to think, they form some sort of loose supportive association. Far from home, working in a cut-throat environment, the idea of actors finding solace in each other’s company seems to fit with the Aussie tradition of mateship. Unfortunately, there is no evidence this actually happens very often. Alf Goulding and Daphne Pollard were two who certainly did. Alf Goulding died in Hollywood in 1972, after his long and very well documented career as a screenwriter and director. It appears that after Pollard’s second North American tour returned in 1904, his talented sister Irene Goulding left the company and returned to Melbourne – where she may have worked in sales. She married a storeman, Albert Smith in 1931, and lived most of her later life in a comfortable house in Riversdale Rd, Hawthorn, where she died aged 98, in 1987. Next Post Daphne Pollard – I had to know 36 operas by heart!